I have many old negatives, including negatives that I had developed but not printed back when I had my own darkroom. I also have many slides including all my wedding pictures to my first husband, who is dead now. My dad also recently died and he had lots of negatives that I was interested in. 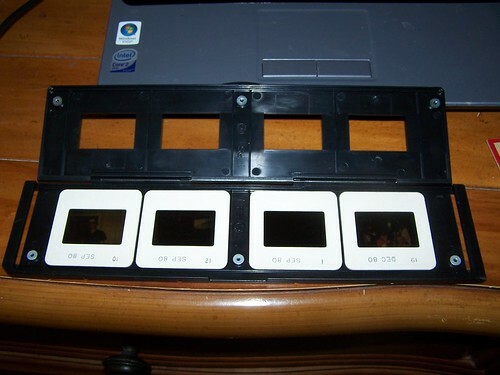 And when I was a baby/toddler, my dad had a 3D camera that took the slides that are double and when you view them in a viewer you see the picture in 3D. So I wanted to convert those as well (not to 3D unfortunately, but actually, my eyes do not focus together properly so I don’t have 3D or depth perception anyway. I seem to function fine though although you’d think it might be problematic). I’d been thinking about this for a while, so when I saw a negative and slide converter on Woot!, for a very cheap price it seemed (about $50), I went off and checked the reviews on it to see if I wanted to buy it. Amazon is where I bought my IT Converter. When I got it, I opened it up and it was very easy to use and understand. It has the base/reader that plugs into your USB port and 2 trays (one for negatives and one for slides) that you click through the converter to read the pictures onto your computer. It comes with film scan software that shows the picture for what is currently in the converter and lets you copy and save it as a digital image. 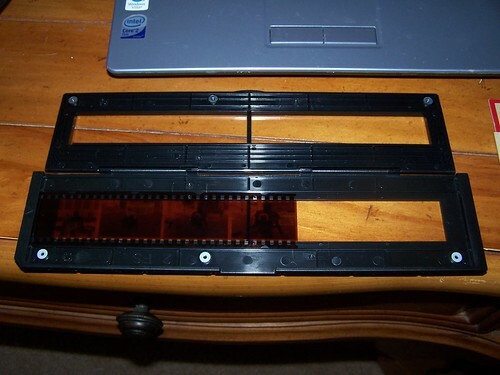 To load the tray, you just click open the cover, put in your negatives strip (or 4 slides in the slide tray), close the cover and put the tray in the slot on the side of the converter. The trays have guides that make it easy to load them correctly. And although most people probably don’t have 3D slides, I was able to load them in by putting two side by side and just printing one of each. 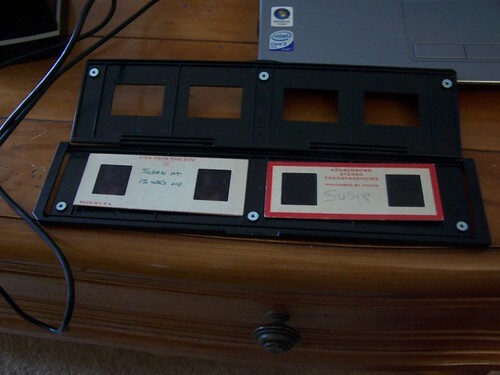 The trays hold several negatives/slides at a time and you manually click the tray through the converter one at a time to capture each picture. It is easy though and not really any more time consuming than anything else. Actually, it is quicker than trying to scan pictures in and save them, at least if you are using a regular scanner. I’m sure the dedicated photo scanners are quicker and someday I’d like to get one, especially if you could load in several photos at a time and it would run them in and scan them automatically. The Pandigital SCN02 PhotoLink One Touch Scanner w/Memory Card for $86 on Amazon looks interesting and got very good reviews. But that is for another day. It’s hard to justify spending money for that when I can do it myself with what I have. But the negative and slide converter is something I was unable to do until now. 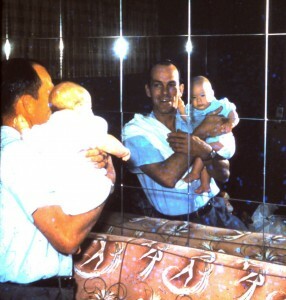 With the software you can capture the pictures, view them, rotate the image, change to mirror image (if the negative or slide was reversed) and save them in a bunch instead of one by one (saving you time by not having to wait for each one to be saved which is somewhat slow). The software is extremely intuitive and easy to use. 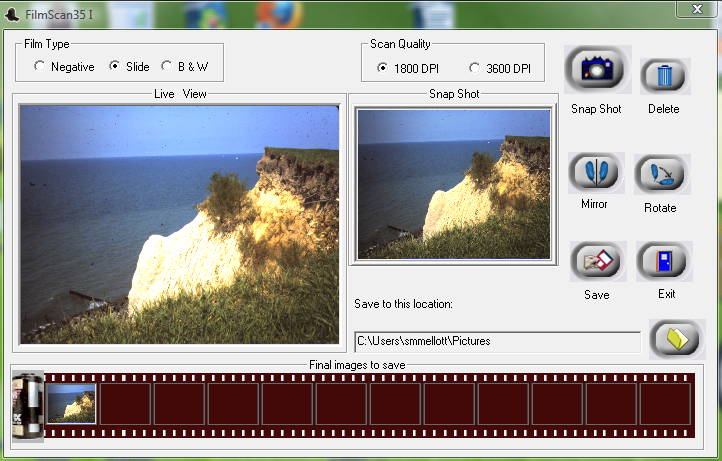 It has very limited functionality, but you can do all the editing you want to the captured pictures after you have saved them by using any other editing program. The filmscan software is also very slow so you have to have patience. Here are some of the pictures I captured (I just did a couple of each type so these are not by any means the best of the captures). The first one is from a 3D slide of me as a baby. 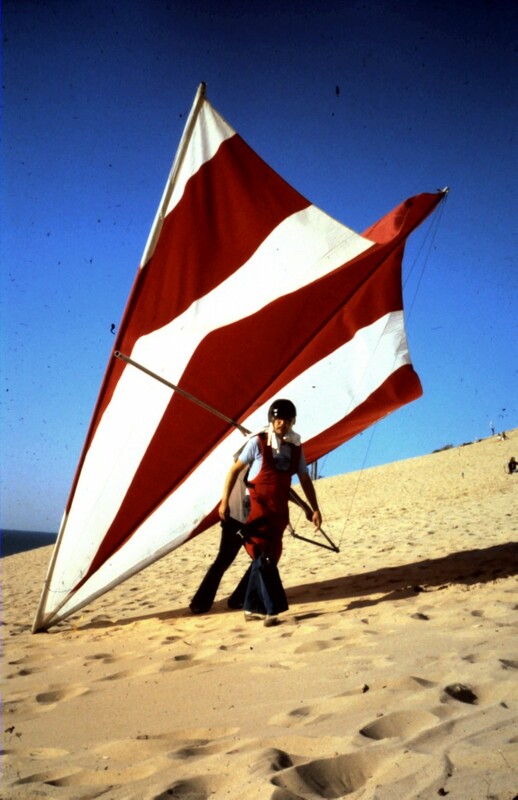 Thennext one is a slide taken about 1980 when we went hang-gliding. 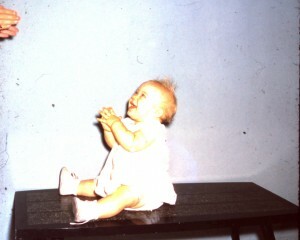 This picture is me when I was a baby, about 1956. It was copied from a negative. None of these captures were edited (except for cropping my baby picture) so this is how they came out. The negatives and slides have been thrown in boxes, kept in sandwich bags and just generally not taken care of. The negatives that were more recent looked better, like the more recent slides (by more recent, I mean the ones taken around 1980). There is also photo editing software you can buy that will go a long way towards cleaning up the pictures after they are scanned. And it is just that easy. Tagged convert, digital, how to, negatives, slides. Bookmark the permalink.